As a Director, being given one of Shakespeare’s best known plays to direct must be a bit like being handed a gift-wrapped life time of Christmases all at once: On the one hand you get the most spectacular array of gifts to play with, but on the other, there’s always the risk, as comes with the familiar, that the experience will descend into Family warfare, as new generations upset the old fogies in the corner, and traditional conservative values give way to brash commercialisation. 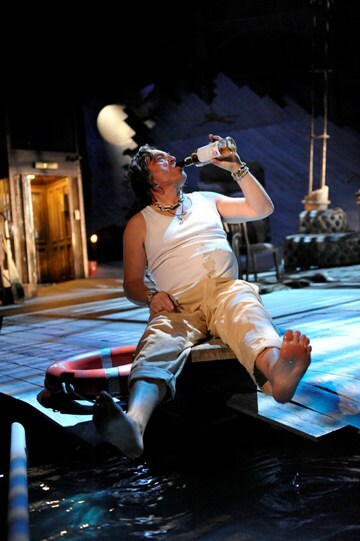 Nicholas Day as Sir Toby Belch in Twelfth Night. Photograph by Keith Pattison. So it is with Shakespeare. You get those who turn up expecting ruffs and garters, men playing all the parts and the accompaniment of Greensleeves or some other suitably Tudor refrain in the background. Then there are those who want to see a familiar tale, with the same dialogue and characters, but retold in a totally reinvented way. I must admit to being one for the latter category. Admittedly, reinvented Shakespeare doesn’t always work. Shakespeare played out in the modern age can jar. Often directors are so intent on modernising that they lose all essence of the story they are reinterpreting. But the RSC’s latest offering, Twelfth Night, now commencing its London season at Camden’s Roundhouse, faces no such problems. Reinvented in a brilliantly original way, but losing none of the charm of the characters nor the tale, this new production, directed by David Farr is, in my refined Shakespearean experience, a phenomenal success. Stephen Hagan as Sebastian in Twelfth Night. Photograph by Keith Pattison. First off, the scenery. It’s brilliant. How to stage Twelfth Night, which on paper is part set in Orsino’s palace, part set in Olivia’s and part set on a beach? Well David Farr and designer Jon Bausor came up with an original solution. 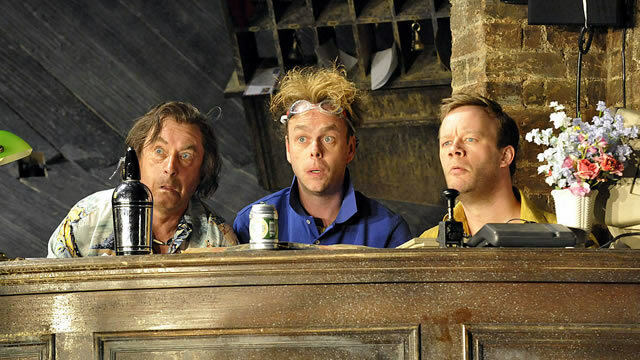 They set the play in a rickety old hotel, reminiscent of Fawlty Towers age hostelries, with a rattling old lift, swing doors, a dusty set of pigeon-holes containing all the room keys, and old-style air con in the form of a single fan with ribbons attach so that they flicker limply in the air whenever the fan is switched on. This hotel setting is in turn amalgamated into a sweeping curved wooden floor, which at the foot of the stage dips limply into a pool of water before curving across the stage into a steep incline at the back of the space, upon which a bed, a bath and other paraphernalia hang steeply suspended, and over which the darting shadows of a ceiling fan spin and flicker. In short, there isn’t a straight line anywhere on the stage, and this gives the set a dilapidated charm perfect for the 70s/80s reinvention. Meanwhile the hotel setting is adapted to both the homes of Olivia and Orsino respectively through subtle lighting changes, all of which give the impression that these people live on some expat seaside resort, where the drunkenness of Sir Toby Belch and co. and the electro-keyboard cabaret of Feste the fool seem perfectly pertinent, like the tragic faded grandeur of Benidorm, or Blackpool on a good day. The best part of the set however has to be the pool filled with real water at the corner of the stage. It is from this pool that at the most unexpected moment, both Viola and a little later Sebastian, the shipwrecked protagonists of the play, emerge, gasping for breath, in the most fantastically realistic staging of a shipwrecked twosome. After this initial use of the pool, that same watery expanse is not forgotten. It provides the backdrop for some brilliant slapstick comedy by the likes of Bruce Mackinnon as a fantastically dippy Sir Andrew Aguecheek, and is a suitable space into which the phlegmatic Olivia can discard the unwanted gifts given to her by love-struck Orsino as she shuns his many indefatigable advances. True, the first few rows of the audience did get relentlessly splashed as the pool slowly emptied upon each dramatic entrance and exit by the actors, but at least they can’t moan that the play isn’t inclusive. Kirsty Bushell as Olivia and Kevin McMonagle as Feste in Twelfth Night. Photograph by Keith Pattison. This brings me to the actors themselves, all of whom were brilliant, but with a few standout stars. 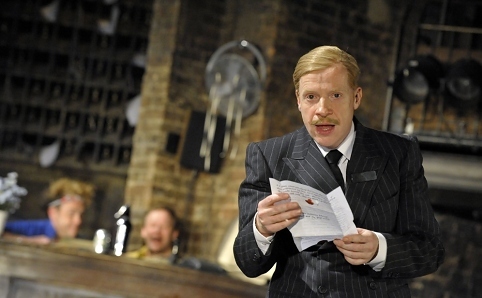 Number 1 for me was Jonathan Slinger as the odious steward, Malvolio. The hotel setting worked best for Slinger’s character, as Malvolio went from palace porter to over-inflated Hotel Manager with a very heavy dose of small-man syndrome, complete with a clip board and name tag – you know the kind. This made for some genius comedy moments, not least when he travelled across the stage in a golf buggy marked “for management use only” and as for the famous scene with yellow stockings and cross-garters – this production took the stockings to an all new level of risqué. It was laugh-out-loud hilarious. And it takes a lot to get me almost doubled over with hysteria. Second standout for me had to be Cecilia Noble as a diva-Queen Maria, the brilliant matriarch in amongst the drunken debauchery of Sir Toby’s den, wonderfully complicit as she was in the grand plan to bring the malevolent Malvolio to his shame. Brilliant too were the energetic Kirsty Bushell as Olivia, Bruce Mackinnon as Sir Andrew, and Nicholas Day as Sir Toby. I was a little disappointed by Emily Taafee as Viola, whose delicate Irish accent seemed a little strained in her efforts to be heard amidst the tomfoolery of her fellow cast members, and more often than not I found it difficult to decipher what she was saying. 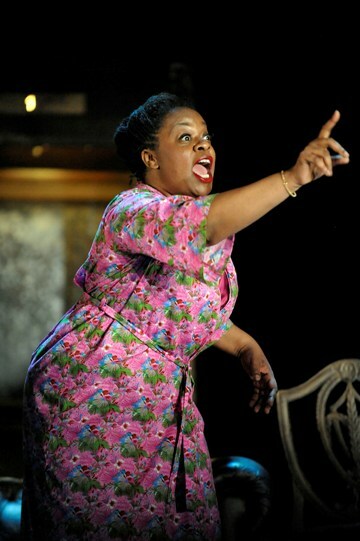 However that too is a problem with theatre (almost) “in the round” which meant that more often than not, we found ourselves facing the back of an actor whose voice simply didn’t carry. No matter – as is often the case with Shakespeare, the old english is frequently difficult to understand in its totality. Which is why the role of a director, in translating that hyperbolic verse into the modern age, is so important. David Farr’s Twelfth Night not only translated brilliantly, but it lived, breathed and pulsated energy and jocularity which was contagious across the Roundhouse audience – even the wet ones at the front. Twelfth Night continues at the Roundhouse until 5 July.